It appears Google is slowly merging Chrome OS and Android together to make a truly interesting OS. A new software update is going out today, updating the app launcher with Google Now. Search is right at the center of things, and the apps follow below it. 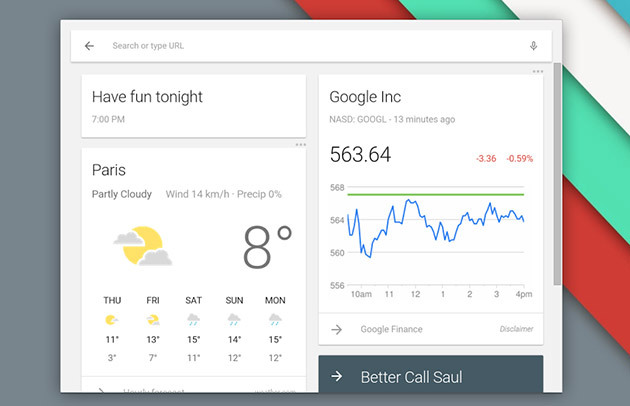 In addition, you’ll get Google Now cards and notifications on your Chromebook from now on. In fact, it’s been there for a while, but it wasn’t as tightly integrated as it is now. That’s not all either. There are a number of other tweaks to the OS, including support for password-protected ZIP files and redesigned file manager and calculator app. The default system font has also been changed to Roboto, which is used in Android’s Material Design. The update has been pushed to the stable channel and should be available now. However, it may still take weeks to actually get it on your system. Google is doing some interesting things with Chrome OS. Other than the new hardware, some of which have been very compelling, Google seems to be slowly bringing together Android with Chrome OS. First, it brought select Android apps to Chrome OS. Quite interestingly, Android apps may soon come to Windows and other operating systems through the Chrome browser. Now, it is consolidating the design between the operating systems. Chrome OS had a rocky start, and it’s still not enough of an offering for those with greater computing needs than a web browser. However, it’s becoming quite a fascinating case study in evolution. I’m curious as to what Google is planning next for the OS, but whatever it is, my interest is piqued.